Established in the 1950’s, TJH Ltd. is the Irish company behind the Celtic Designs Jewelry brand. We are a third generation family business based in Dublin, Ireland. Celtic Designs Jewelry is dedicated to creating beautiful jewelry inspired by Irish legend and ancient Celtic folklore and symbols. We aspire to make all of our jewelry uniquely Irish but universal in appeal, giving you a piece of heritage to carry with you, that will last for decades. Gary continues his family legacy in the jewellery business. He is the third generation of Pillows to do so. 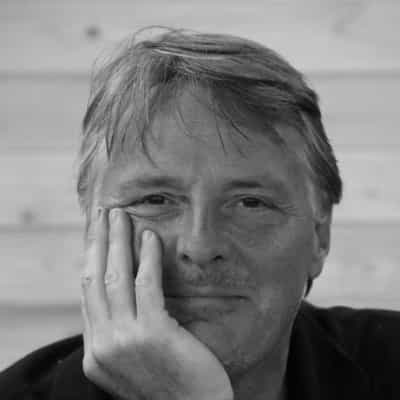 His earliest memories of the trade are as a young schoolboy during holidays when he would visit the family business with his father to say hello to all the staff. The smell of jewellers rouge, the flickering of torch flames and the percussion section of hammer on mandrel was all it took, and it was in the veins of another generation. Gary joined the business in 1980 and began a journey of discovery into an industry like no other. There was so much to learn, so he started at the beginning and is happy to say that every day since he first began his career in the jewellery business is a learning day. Over our 60 year history, supplying quality product has been key to our success. Backed by unrivalled customer service, we are very proud of our hard-earned reputation in the jewelry industry. Our range consists of a comprehensive Gold and Sterling Silver collection. All of our jewelry is authenticated and hallmarked by the Assay Office in Dublin Castle, which ensures its distinctly Irish providence. It is your independent guarantee that your purchase is certified Gold or Silver and it’s an assurance of the quality of the materials used in your purchase. Making jewelry is in our blood. For three generations, the Pillow family have been raised designing and making Celtic jewelry. Celtic jewelry is our passion and our history is built on innovating beautiful designs and quality jewelry for our customers. 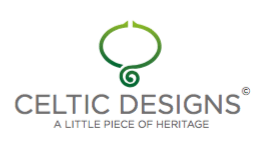 For decades, we have forged the way in Celtic jewelry design and brand innovation. We were the first Irish manufacturer to launch an Irish jewelry brand – Children of Lir in 1995. The Children of Lir brand continues to flourish, enthralling and captivating customers across the world, over 20 years on. We will continue to innovate and design bespoke jewelry rooted in Celtic folklore, that delights and inspires the imagination as only an Irish legend can. When you purchase a piece of our Celtic Designs jewelry, you carry a piece of Irish Heritage with you that will endure for decades. Since the 1950s, we have strived to design and manufacture the highest quality of jewelry. Throughout this time we have proudly received many awards and accolades from our peers and our customers. We are proud of our achievements and associations. 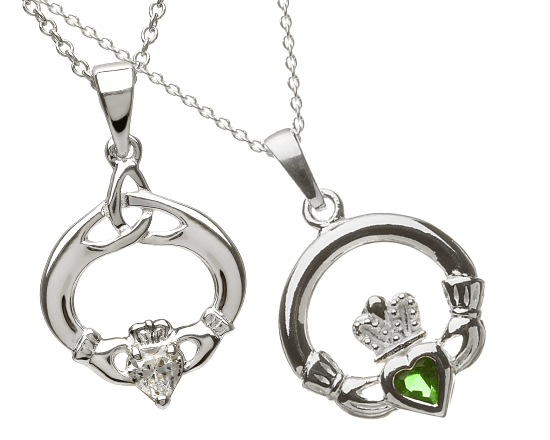 We share them with you so that when you purchase from Celtic Designs Jewelry, you can do so with confidence, secure in the knowledge that you are dealing with an Irish company that has earned its reputation from reputable sources and through our associations are committed to the highest standards. 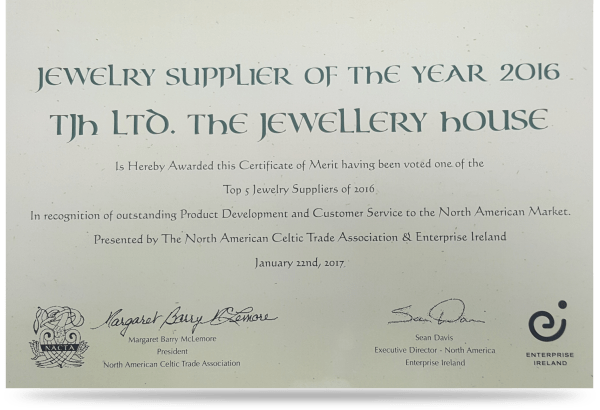 Most recently, in 2016, we were voted one of the top 5 Jewelry Suppliers of the Year and awarded a Certificate of Merit from the North American Celtic Trade Association and Enterprise Ireland. This award is given in recognition of outstanding product development and customer service to the North American Market and we are incredibly proud to receive it. We are members of the FJMI (Federation of Jewellery Manufacturers of Ireland) the IJA (Irish Jewellers Association) and are registered with the Design & Craft Council of Ireland. The Federation of Jewellery Manufacturers of Ireland was established in 1963 to coordinate the manufacture of jewellery in Ireland. FJMI members undertake to carry on the ancient tradition of jewellery making and to abide by a strict code of ethics, giving assurance to customers that jewellery items purchased from members have been crafted with care, skill and pride. The Design & Crafts Council of Ireland (DCCoI), headquartered in Kilkenny, is the main champion of the design and craft industry in Ireland, fostering its growth and commercial strength, communicating its unique identity and stimulating quality design, innovation and competitiveness. 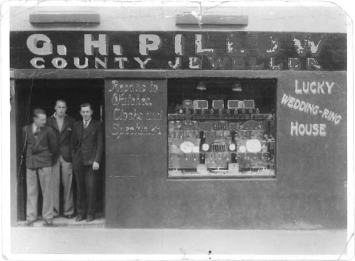 The IJA represent an association of Irish Wholesale Jewellers, Irish Watch Importers and the Irish Giftware Trade and look to offer you reliability, service, good prices and business comfort when dealing with the Irish Jewellery Trade. The North American Celtic Trade Association (NACTA) is the trade association for the Celtic market in North America. Its membership represents retailers, vendors, manufacturers, distributors and others involved in this niche market. Its mission is to facilitate communication among businesses involved in the Celtic market in the USA and Canada and to develop and implement programs of value to its members.